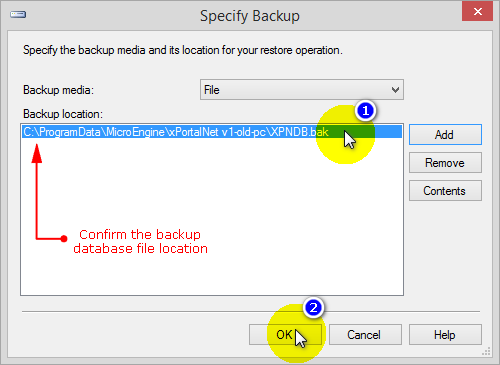 This article contains steps to restore the xPortalNet database at the current Server PC using existing backup files (.bak file format). › The XPNDB/ XPNTR folder has been deleted from the SQL Server Database. › From the physical xPortalNet Server folder, the XPNDB.mdb file is deleted/ not exists. Caution! Modifying database will affect the software behavior. Only perform this steps if you are familiar with the SQL database otherwise kindly request from your IT Technician for help. To restore the xPortalNet database, please follow the steps below. Please follow all steps in right order and sequence. 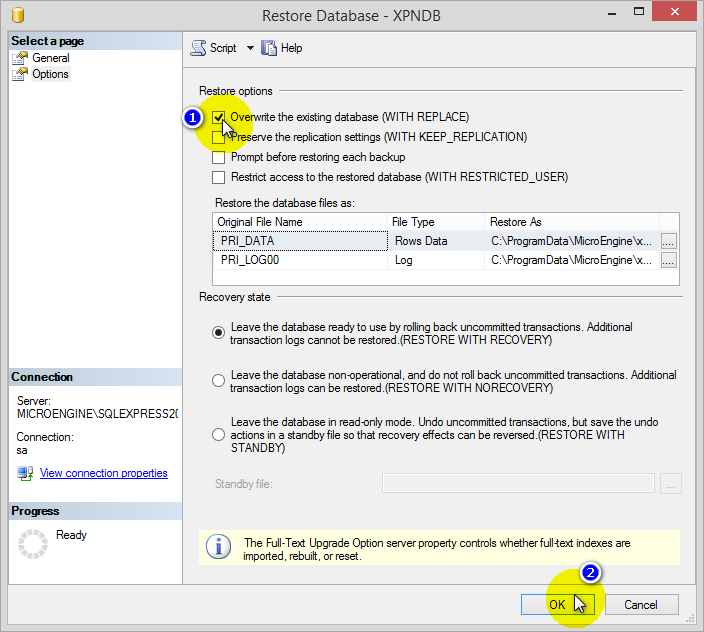 » This restore database steps also applicable for restore transaction database with .bak file format only. Make sure the physical xPortalNet Server folder is still exists. The only deleted file is the XPNDB.mdb file only. » If the physical folder is also deleted, please follow the steps to restore database from this article AA-00295. Make sure you have the back up database which is in .bak file format. Make sure xPortalNet software is not running. Exit the Service, Server and Client completely. The Connect to Server pop up window will be shown. Enter the Login ID and Password. 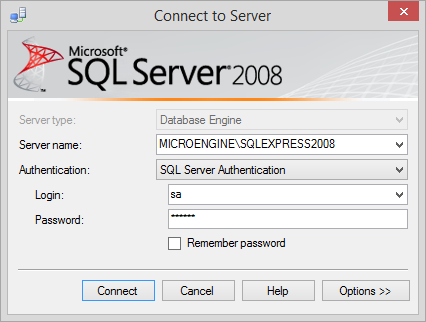 » The Login ID (Instance ID) and Password is created during Microsoft SQL Server 2008 installation. See AA-00290 for the installation step. At the top left side menu, find the Databases folder. 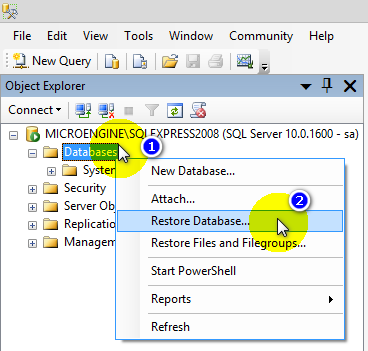 Right click and select Restore Database. 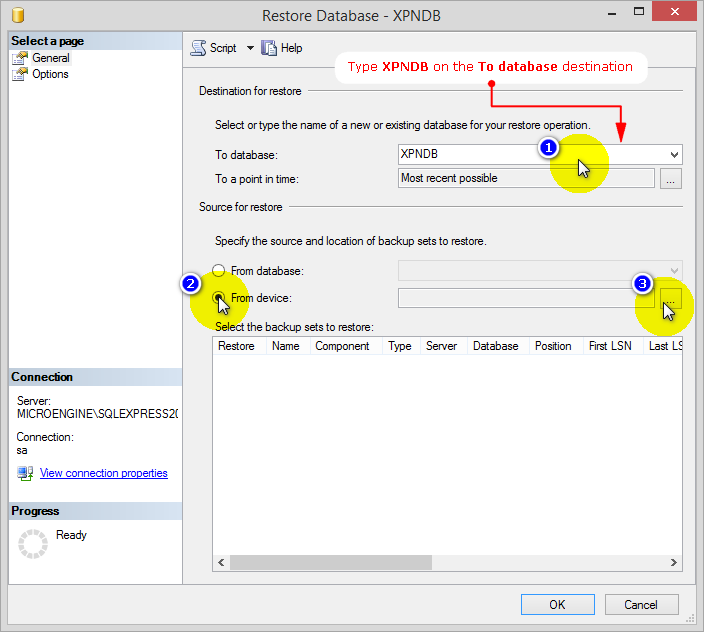 The Restore Database – XPNDB window will be shown as following. Key in XPNDB in the Destination for restore box. 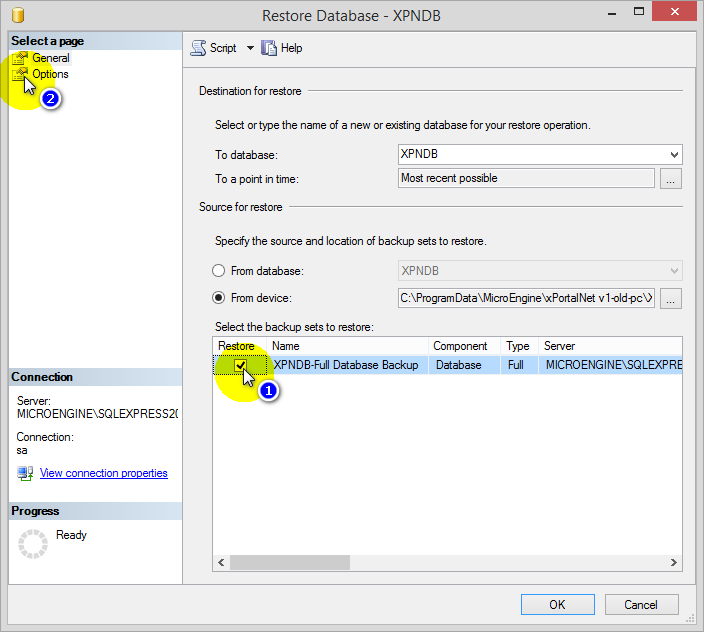 For the Source for restore, select From device then browse the back up database file. Click Add to browse the back up database file. Select the location of the back up database file. Click OK. Please confirm your back up database file location. Tick the back up sets that you wish to restore. At the top left of the windows, select Options page. At the Restore options section, tick the option Overwrite the existing database (WITH REPLACE). 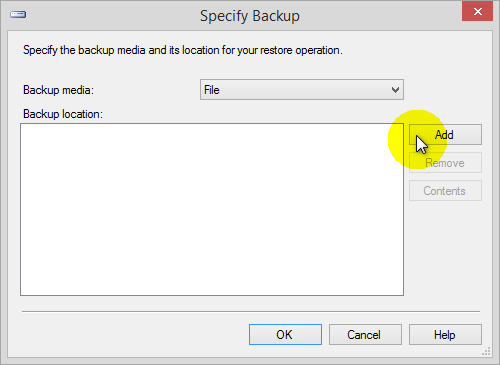 Click OK to start restore the back up database. You should see this pop-up window when the restore of database is completed. Click OK to finish. 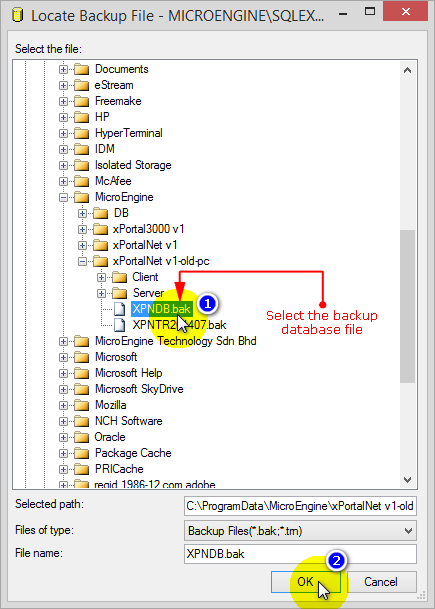 Summary: This article contains steps to restore the xPortalNet database at the current Server PC using existing backup files (.bak file format). How to install Microsoft SQL Server 2008? How to back up xPortalNet database?